Shirley Chisholm (Born Shirley Anita St. Hill) was a teacher, scholar, orator, intellectual and public servant whose lifelong work continues to shape the American social and political landscape today. 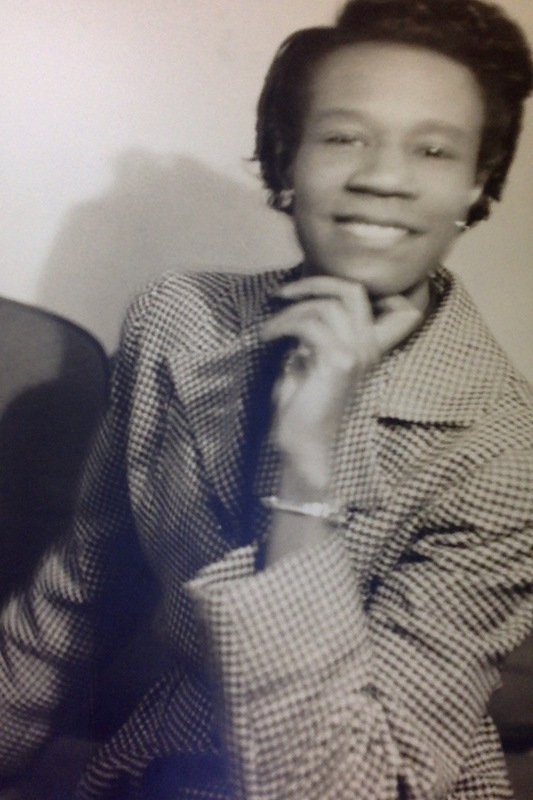 She was born on November 30th, 1924 in Brooklyn to immigrant parents from British Guiana and Barbados. She credits her grandmother Emaline Seale, who raised her when she lived in Barbados from age 5 to age 9, as source of “strength, dignity and love”; she credits her mother Ruby Seale for inspiring her as a model for moral authority and conviction; she also credits her father Christopher St. Hill (a devoted follower of Marcus Garvey) for igniting her political consciousness and supporting her leadership aspirations. 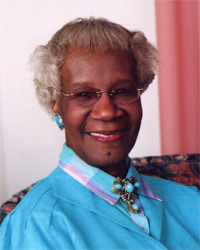 After growing up in Barbados and Bedford-Stuyvescent, she attended Brooklyn College from 1942 to 1946. After she gained her Master’s at Columbia Teacher’s College, she dedicated her career to early childhood education. She served as the director of day-care centers in Brownsville and lower Manhattan, and then became a consultant for the Division of Day Care in the New York Office of Children and Family Services. It was this interest in the welfare of young people, combined with the political consciousness sparked in her by her father, that pushed her into the world of public service. Chisholm spent years painstakingly climbing up the lowest levels (and most thankless) levels of politics in organizations like the Seventeenth Assembly District Democratic Club and the Bedford-Stuyvesant Political League. 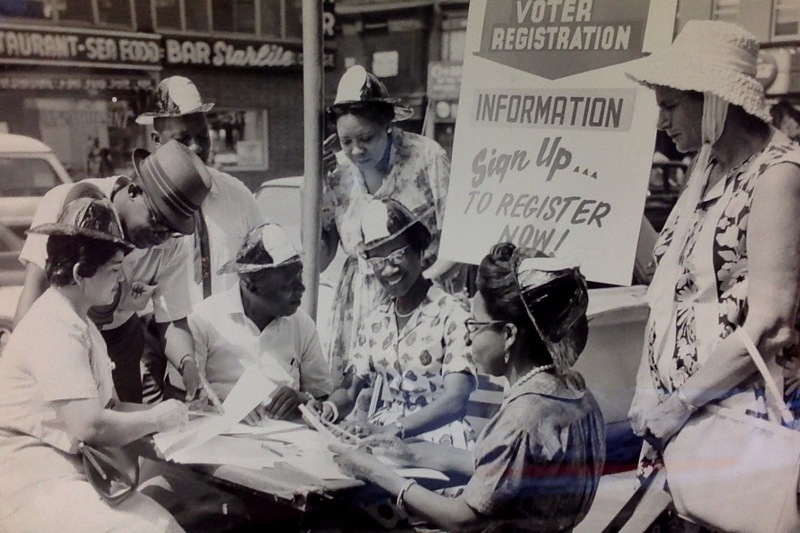 “I was one of the ‘party workers’,” she describes in one account, “stuffing envelopes, organizing rallies, writing speeches and answering phones.” Confronted with the routine marginalization of women in the political process, and incensed by the idea of white politicians dictating the policies that would impact the lives of majority-Black neighborhoods, Chisholm sought political power in her own right. After gaining significant experience as a party worker, organizer and leader in child welfare, she launched her own political career that took her from the New York State Assembly to Capitol Hill to the presidential campaign trail, national prominence and international renown. 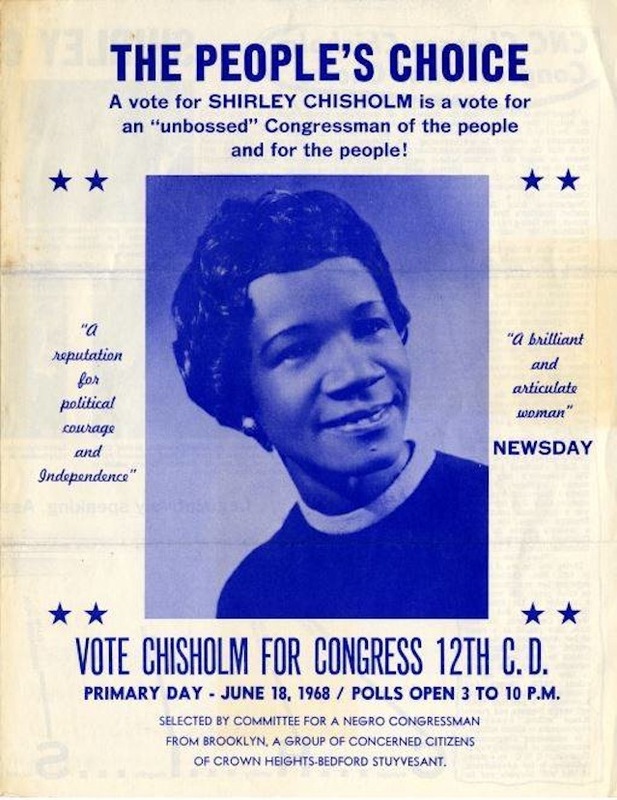 Chisholm is best-known for her election as the first Black woman to the House of Representatives in 1968, and for her groundbreaking campaign for the presidency which she launched in 1972. In that campaign, she asserted herself as the first Black candidate to run for a major party nomination, and the first woman to run for the Democratic nomination. Although she is best remembered for the cultural impact of her congressional and presidential campaigns, the causes and reforms she championed along the way are just as important. In the NY legislature, she pioneered the SEEK (Search for Education, Elevation and Knowledge) program. The program is funded by New York State to provide financial support and individualized counseling low-income students who enroll in the CUNY system. 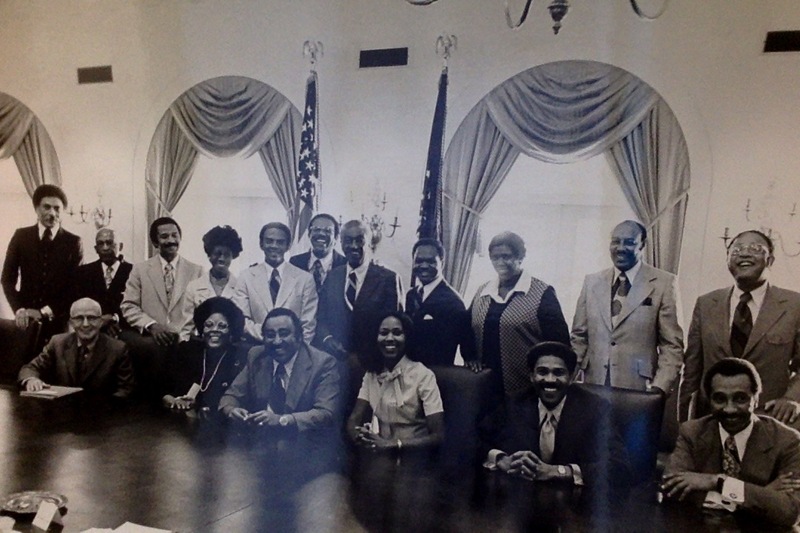 To this day, students at The City College of New York, Brooklyn College, Hunter College, Medgar Evers College, John Jay College, Queens College, Lehman College, York College, the College of Staten Island and Baruch College all have greater access to higher education as a result of her legislative work. In Congress, she was a founding member of the Congressional Black Caucus. She protested the massive war spending in Vietnam in the face of significant poverty in the US. She fought for the Equal Rights Amendment, enlisting women into public service, publicly-funded daycare, parental leave, civil rights for Black people, voting rights for all, and women’s reproductive freedom. Also, she was deeply concerned with issues of hunger in the United States and throughout the world, lending her influence to the expansion of food stamps and acting as a key architect of the WIC program. 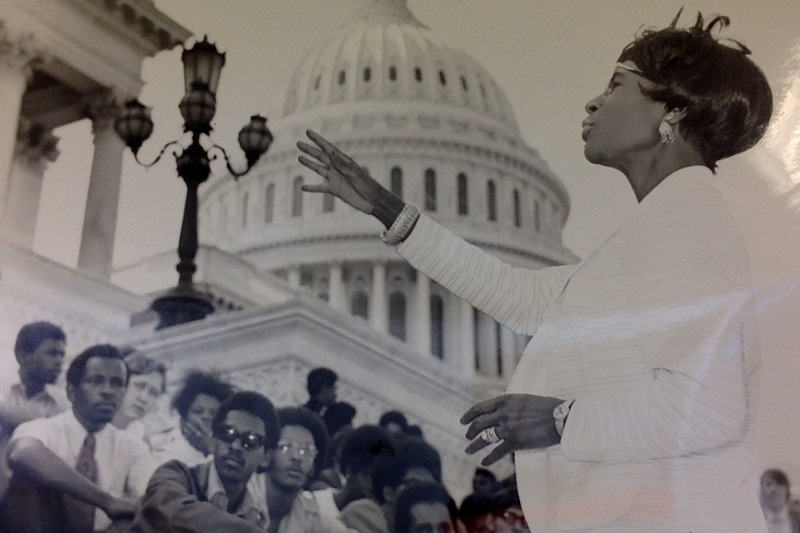 During her presidential campaign, and especially in the latter half of her Congressional career, Chisholm expanded the focus of her advocacy to international issues. Notably, she championed the rights of Haitian Refugees and protesting racist practices and double-standards in U.S. immigration policies that normalized persecutory treatment of non-white migrants. While she began as an icon for the feminist movement in the United States, she increasingly became a voice on international women’s issues, paying particular attention to human rights issues that impacted Black women throughout the globe. She also expanded her earlier emphasis on the need for anti-hunger and nutrition programs in the United States to address poverty and world hunger globally. By the end of her time in public service, Chisholm had become an expert on a wide range of issues and policies impacted women, children, migrants, nonwhites and the poor throughout the world. After leaving Congress in 1982, she continued her career as an educator, this time as a professor at Mt. Holyoke College (and temporarily Spelman College) where she taught courses in sociology and political science. She visited colleges and universities throughout the country where she sought to protect the Civil Rights legacy from conservative ascendancy of the 80’s, educate on women in politics and international women’s issues and empower minority youth to participate in the political process. 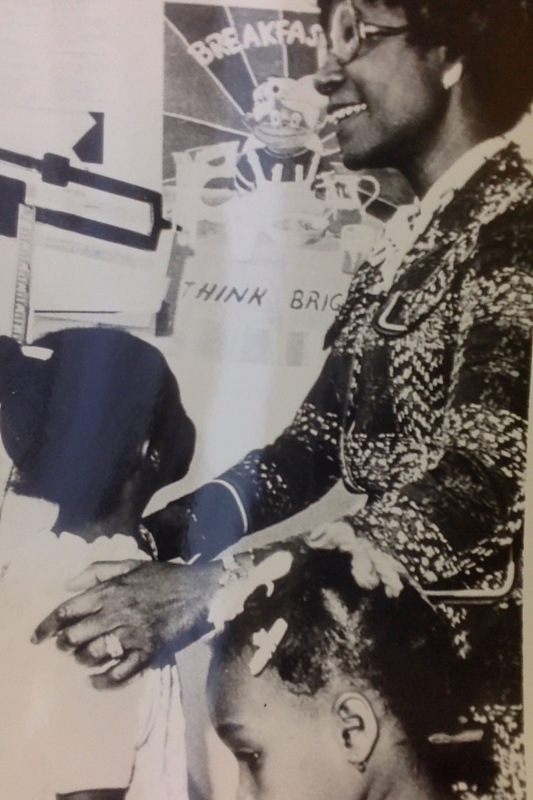 Shirley Chisholm was also a prominent supporter and campaigner for both of Jesse Jackson’s bids for the presidency. Along with other prominent figures in the realms of politics, Civil Rights and Women’s Rights like Dorothy Height, Maxine Waters, Donna Brazile and Byllye Avery, she was a founding signatory of African American Women for Reproductive Freedom. The purpose of this organization was to defend Roe v. Wade, raise awareness about the history of reproductive violence and injustice perpetrated against Black women in America and tend to Black women who were often left out of conversations about women’s reproductive rights. 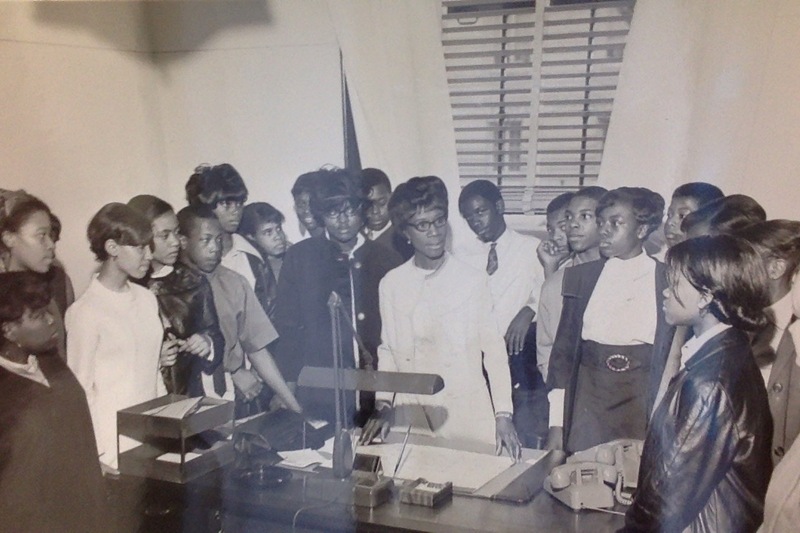 The Shirley Chisholm Project at Brooklyn College is proud to curate her archival legacy and continue her work towards social and political transformation throughout the world. Our mission is to refine the narrative beyond the symbolism of her career and promote a deeper understanding of the substantive impact of her work. We hope that as you explore this website, you will discover more about her life. We hope you will also gain a fuller consciousness of the other amazing women who follow in her footsteps, and continue the work still must be done to fulfill her vision for a more just and humane society. This brief account only scratches the surface of Shirley Chisholm’s story. To learn more, please visit peruse the “Explore More Resources” section of this website as well as our Oral History Project. You should also check out our archival materials at the Brooklyn College Special Collections. 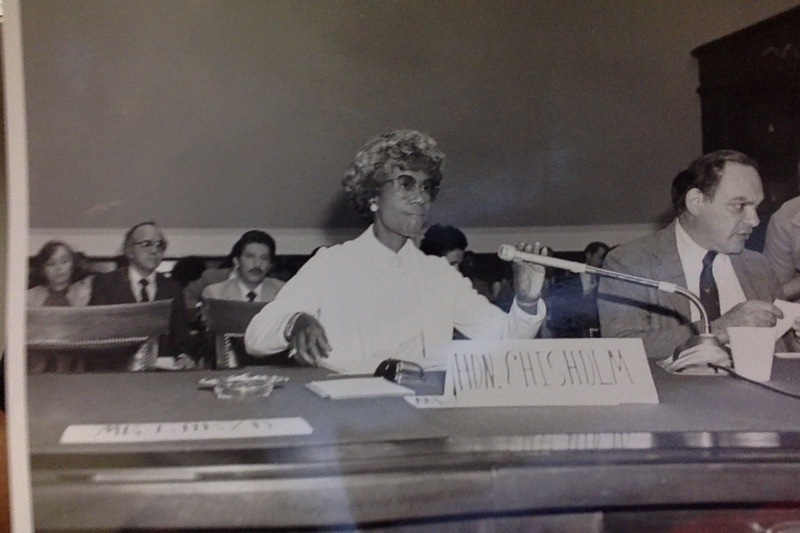 You can also find more about Shirley Chisholm through the Shirley Chisholm Papers at Rutgers University. Also, click here for a list of Chisholm’s speeches that the Iowa State University have made available online.